Soccer Explainer: Why Gauze Over Stitches? : Show Me Your Cleats! 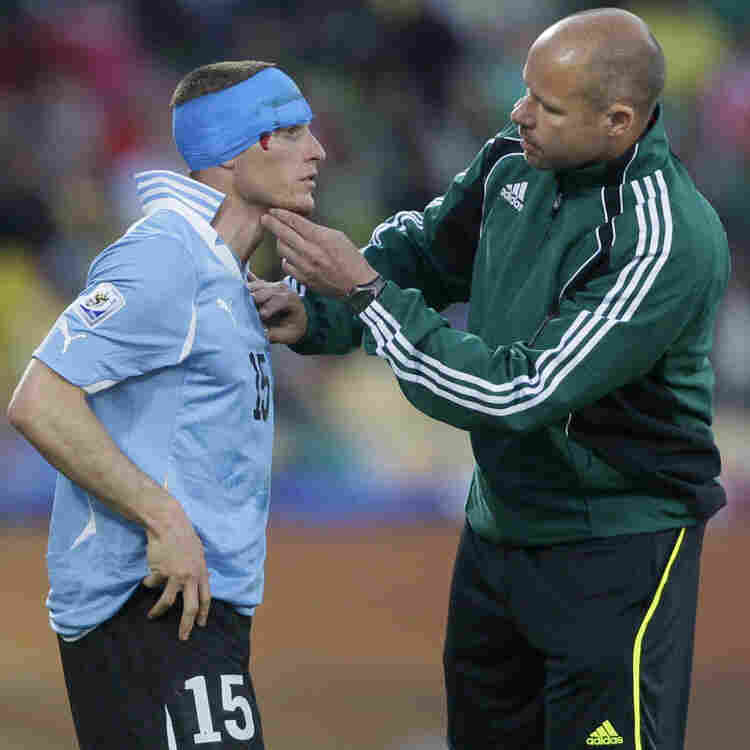 - World Cup 2010 Blog NPR's Tom Goldman is flummoxed by the poor handling of Uruguay midfielder Diego Perez's bloody head. Soccer Explainer: Why Gauze Over Stitches? In a sport filled with excess, from choreographed goal celebrations to Oscar-worthy acting performances (yeah, we’re talking to YOU Kader Keita of the Ivory Coast) the treatment for injured Uruguayan midfielder Diego Perez seemed laughably over-the-top. Perez appeared to take an elbow from a Mexican opponent during Tuesday’s Uruguay vs Mexico match -- won by Uruguay 1-0. With blood streaming down the side of his face, Perez left the field for treatment of a cut near his right eye. He returned to the pitch with blue gauze wrapped around his entire head, conjuring up iconic images of fife and drum and the American Revolutionary War! DESPITE the head wrap…the blood kept flowing and Perez was sent off again because the rules state you can’t a). be actively bleeding during play and b). have blood on your uniform. This messy, painful and, I’m sorry, comical scene made me think of Steve Nash. During the recent NBA playoffs, Nash, a point guard for the Phoenix Suns, similarly took an elbow to just about the spot where Perez received his. Nash left the game, got stitched up and came back, with a bandaid. Which for me begged the question: with all the millions of dollars paid to elite soccer players, could a national team competing in the World Cup perhaps afford a better cut man? Ah, but comparisons aren’t so simple. After his injury, Steve Nash left the court, went to his locker room for treatment, and his team was able to fill his position on the court. The doctors fixed him up without fear that his absence would significantly effect the game. Soccer, however, is a different story. When a player leaves the match with an injury, the coach has to make what can be a critical decision – substitute for the injured player or rely on your doctor’s ability to fix the injury quickly and get the player back out on the field. In soccer, once a coach has made a sub, you can't put that player back on the pitch. And the risk of the second strategy, is that while you’re waiting for the injured player to return, you can’t replace them. The team must play a man down. Sometimes with negative consequences. The point is, soccer doctors have the added pressure of working as fast as possible, so the game doesn’t turn while they’re sewing up a gash. Which is why they may choose to STAPLE before stitching or quickly wrap a player’s entire head in gauze. In Diego Perez’s case, it may have looked goofy. But hey – at least the head wrap matched his jersey.